"Dude, I service society by rocking, ok? I'm out there on the front line liberating people with my music. Rocking ain't no walk in the park, lady." 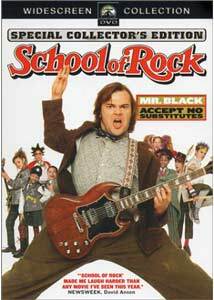 School of Rock, from director Richard Linklater (Dazed and Confused), could easily have become one of those by-the-numbers/feel-good/underdogs-rise-up films that Hollywood uncorks with disturbing regularity, but it benefits from a laughably manic lead performance by Jack Black and a genuine, apparently heartfelt display of what it means to be taken over by the sheer love of rock and roll. Black plays aging, going nowhere wannabe rocker Dewey Finn, who, after getting fired from his band, ends up taking a substitute teacher gig for a fifth-grade class at a prestigious prep school. It is actually pretty easy to take the staggering leap of faith required to accept the premise surrounding uptight school principal Ms. Mullins (Joan Cusack) actually hiring Finn, because the illogical stretches in the script by Mike White (who co-stars as Black's spineless roommate) are made reasonably acceptable, thanks in part to Black's over-caffienated performance. This is the story of Finn gleefully corrupting the minds of his new young charges with all things Rock, going so far as to start a top secret class project, the sole purpose of which is to compete in an upcoming Battle of the Bands competition. We've seen this kind of story a million times before, where an oafish, irresponsible soul takes control of a group of kids, and how both sides learn valuable lessons from one other in the face of authoritative adversity. That's all well and good as a genre template, but in School of Rock things are so wonderfully exuberant that the familiar nature of the storyline is overshadowed by the simple fun of watching events unfold, and farfetched moments like the students installing cameras in the hallway to watch for nosy Principal Mullins, while Finn and his band are off at an audition, are somehow tolerable. Even the old music montage sequence, that tired technique generally employed to quickly propel a narrative forward without dialogue, is more enjoyable here simply because it is set to the unmitigated coolness of The Ramones Bonzo Goes To Bitburg. School of Rock was built specifically for Black, and his all-over-the-screen gyrations is the glue holding this one together, and though he is often obnoxiously turned up to 11 at all times, it is hard to not to get carried along by his performance. His Dewey Finn, trapped in a largely unrealistic story, embodies the love of rock that sadly grows out of a lot of people as they mature, and it is that lack of what is considered proper maturity that gives his character the kind of ricocheting bullet frenzy that is so fun to watch. The students who get drafted into Finn's rock project are a cute bunch, and cross the usual genre stereotypes for a film like this (cocky kid, smart kid, shy kid, nerdy kid, fat kid, effeminate kid), and their big rock number plays out not that unlike a similar moment in Revenge of the Nerds, complete with wacky costumes and hairstyles. This is not really an example of innovative filmmaking, and it is not a film that offers scathing social commentary or even particularly insightful character development. It is, however, a fun little rock and roll comedy with Jack Black as the uber-music lover, carrying the weight of rock and roll on his shoulders, and dispersing that load onto a group of cute, likeable kids. Image Transfer Review: Issued in 1.85:1 anamorphic widescreen, School of Rock sports a largely nice-looking and crisp transfer with fine detail. This isn't a title that will necessarily blow you away with its stunning clarity, but it is a pleasing, evenly mastered disc. Colors and fleshtones are well-rendered across the board, with strong shadow delineation. A bit of specking was evident in a few scenes, but overall there was very little in the way of debris or dirt. Note: Paramount has released two separate versions of School of Rock (widescreen and full-frame), so dependent on your preference, be sure to double-check the top of the front cover. Audio Transfer Review: I might have expected the 5.1 Dolby Digital surround track on a film so enamored with the love of rock music to be slightly more aggressive, but perhaps I was just wishing too hard. That's not to say that there is anything wrong with the track, it does deliver clean, easily discernible center-anchored dialogue, with most of the audio split across the front three channels. Rears come alive once in awhile to nice effect, and when it occurred it only made me notice the infrequency that much more. The music, and there is plenty of rock here, does sound great, but some of the lyrics on the kid's song occasionally end up a bit buried in the mix. A 2.0 English surround track, as well as a French 5.1 surround dub, are also provided. Extras Review: There's a fun, watchable cross-section of material here, especially for a single-disc release. Leading things off is a breezy full-length commentary from Richard Linklater and Jack Black, and it is one of those chatty, nonstop tracks that is easy to listen to. Black is typically self-effacing, and they reveal neat tidbits like what they consider "small victories" in terms of dialogue that made it past the censors The only thing that kind of bugged me, though, was their frequent mentions of deleted or alternate scenes, and none of them managed to show up on the disc anywhere. There is also a second commentary, a so-called "Kids Kommentary," that allows Joey Gaydos Jr., Kevin Clark, Maryam Hassan, Rebecca Brown, Miranda Cosgrove, Caitlin Hale, and Robert Tsai to take center stage. Not the most riveting track, but it's kind of cute, and they seem to be having a good time. This one is more likely geared to younger viewers. Lessons Learned in School of Rock (24m:49s) is a nicely constructed EPK that features the usual collection of interviews and behind-the-scenes clips, but this one actually was entertaining. Black cracks wise throughout (no surprise there) and the band kids talk about their experiences on the set and their music backgrounds, and things conclude with a great bit from Linklater and Black discussing whether or not to call the film The School of Rock or simply School of Rock. Jack Black's Pitch to Led Zeppelin (03m:35s) is a clip begging "the gods of rock" to allow the production to use the band's classic The Immigrant Song. It features Black, backed by a screaming crowd (apparently shot during the big concert sequence) making his case, which worked, by the way. MTV's Diary of Jack Black (16m:32s) is another silly series of Black acting nutty in a thinly disguised promotional piece for the film, and it has a few decent laughs, but isn't as enjoyable as the Lessons Learned in School of Rock segment. On the lighter side, The School of Rock music video (03m:38s) has Black and the kids hamming it up in between clips from the film, all set to the band's big number, and the Kid's Video Diary: Toronto Film Festival (08m:13s) shows the young stars enjoying their premiere party, studying, and being starstruck at meeting Fran Drescher and the Olsen twins. DVD-ROM extras showcase one of the cleverest parts of the film, which is Dewey's Chalkboard of Rock. This segment is broken up into three sections, one of which allows you navigate the board to read what bands fall under which category, and how Dewey considers them interconnected; plus, you click on the artists name and it pulls up a brief description of the band. Richard Linklater and Jack Black offer a brief Quicktime clip discussing the board's purpose, and Black also describes his four favorite bands. Other DVD-ROM extras include a link to the theatrical website with a few pages of text entitled The Film, Quicktime Behind The Scenes clips, wallpaper, Buddy icons, a Winamp skin and three goofy games (Rock Aptitude Test, Band Name Generator and Stage Dive Dewey), and a 14-image photo gallery. In addition to a trio of trailers (School of Rock, Paycheck, and a great teaser for The Stepford Wives), the disc is cut into 18 chapters, and features optional English subtitles. You have to love a film that professes such an endearing love of rock and roll, and though it is predictable and not particularly believable, it is consistently high-spirited and fun.